Park City’s Western Steak House since 1976. Dinner starts with your choice of Caesar Salad, a bowl of Wild Rice and Mushroom Soup or a trip to Park City’s best Salad Bar. Our custom aged Beef, Fresh Fish, Seafood, Lamb and Chicken entrees are served with your choice of side dishes. A list of carefully selected Wines, as well as a full selection of Cocktails and Beer will enhance your dining experience. The Western atmosphere is casual, the service professional and friendly. Live entertainment on Fridays and Saturdays and during Holiday periods. 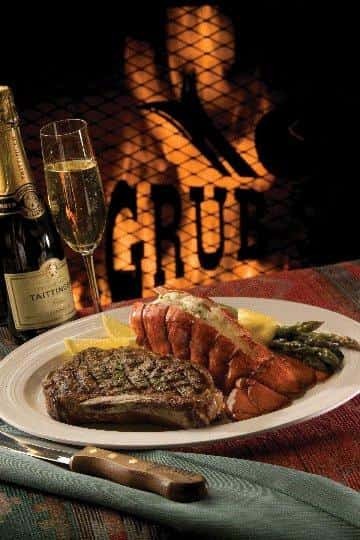 From the rustic fireplace to the Western memorabilia, the Grub Steak is the stuff of Legends! The food is legendary as well, from custom aged Beef to Salmon and Halibut flown in from the Northwest, a slab of Prime Rib as big as the plate, Hunters Mixed Grill or Chops of all naturally aged Rocky Mountain Lamb. The Salad Bar, which stretches the length of the display Grill, is included in all Dinner Entrees as is Creamed Spinach, baked Potato, Lemon Rice or mashed Potatoes. All Breads and Desserts, like the famous Mud Pie or Bread Pudding with Vanilla Bourbon Sauce, are made in house. For a quick and tasty Lunch, try our Soup, Salad and Sandwich Bar or one of our home-ground Sirloin Burgers, fresh Salads and Sandwiches. Reservations gladly accepted, easy and free parking, located on the complimentary Municipal Bus route. Available for functions from 25 to 225 guests, banquet menus are available.